Parets goes onto discuss the relative under-performance of financials and out-performance of energy indicating we are in the region of a market top which will anticipate the economic peak. Of course there are a number of variants and some include precious metal positioning. The graphic below would indicate strength for precious metals alongside energy. Some would suggest that the mining stocks while benefiting from the gold price could suffer from higher energy costs. 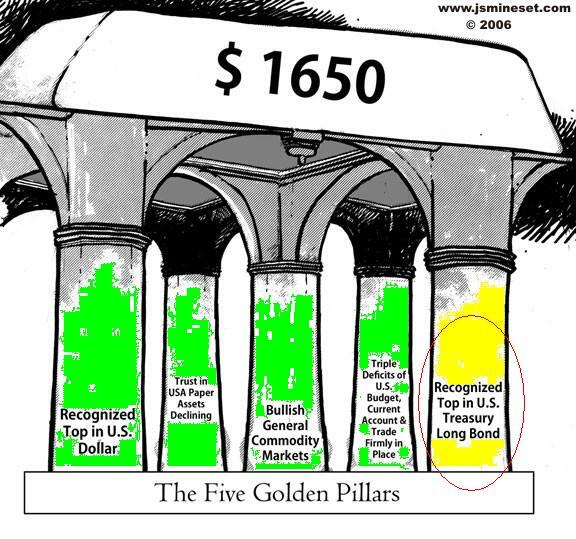 Many commentators suggest that gold and the miners are seeing an inverse correlation with the stock markets which could see counter-cyclical moneyflows with a market downturn, however that would be contrary to 2008 and the "standard" cycles indicated. Here similar from Martin Pring with commentary and including treasuries positioning. Of course the usual signal / trigger for the end of a boom cycle is rising interest rates. Current extra-ordinary monetary policy seeks to communicate delay to this point. Can this extend the cycle? Has it extended it in a bull market that has run for 5 years? Clearly the market should be ahead of the economic cycle turns. Given continued high debt levels the expectation of renewed extra-ordinary monetary policy might see different reactions in precious metals from the standard inflation/deflation business cycle? 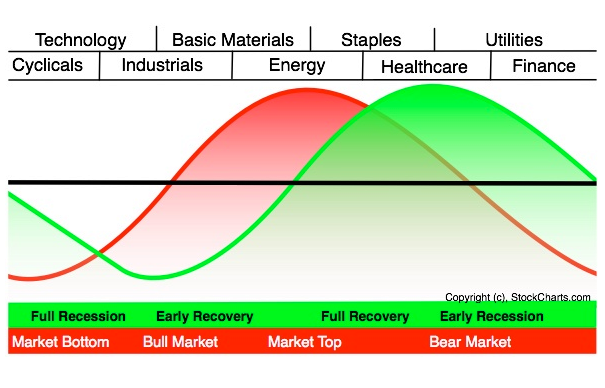 And Similar below - but note Swanson goes on to discuss economic cycles around this chart in 2011 seeing the rise in energy and materials then as indicating the last innings of the bull market, yet here we are in 2014 with crashed gold and commodities but a market that has continued to rise strongly. Swanson's discussion is interesting pointing to Fed interest rate rises only after wage rises then marking market turns. As those wage rises did not come and the Fed did not increase rates the market has continued to climb. Rate increases now have significant implications for debt service costs without monetisation. 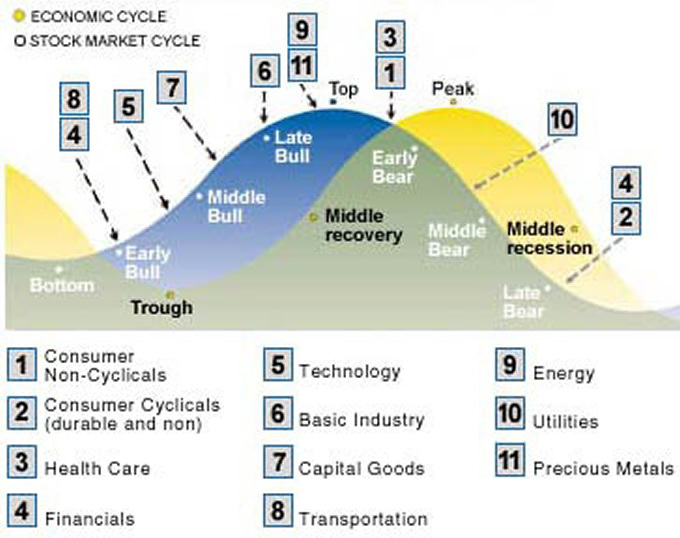 And we had this from Quinton Hennigh suggesting that mining and exploration proliferate after the peak in gold over the S&P, more about the longer cycles than each business cycle.